In many kiosk scenarios you may want to require visitors to stay within certain Internet domains or on specific pages. Using the Allowed Domains list will allow you to specify where the visitor is able to navigate to while using your kiosk. Select 'Edit' in the top navigation bar. Select the plus icon (+) from the bottom navigation bar. Enter a URL and select 'return'. You can edit the URL again by touching anywhere in the white space. Touching the circle to the left of a URL will select it, allowing you to duplicate it or delete it. You can reorder URLs in the list by touching the list icon on the right of the URL and dragging up or down. You can also select or deselect all URLs. If the allowed domains list is left blank, no restrictions will be placed on the browser and the visitor will be able to view any website they choose. If you are limiting at the domain level, it is not necessary in allowed domains to prefix the domain name with http:// or www. Kiosk Pro is only interested in the domain name itself. You can use wildcards (*) to stand in for certain parts of a URL so *.edu would allow any web address on a .edu domain (like http://www.example.edu). In many kiosk scenarios you may want to make sure visitors cannot access certain Internet domains. Using the Restricted Domains list will allow you to specify which domains and pages the visitor is not able to visit while using your kiosk. 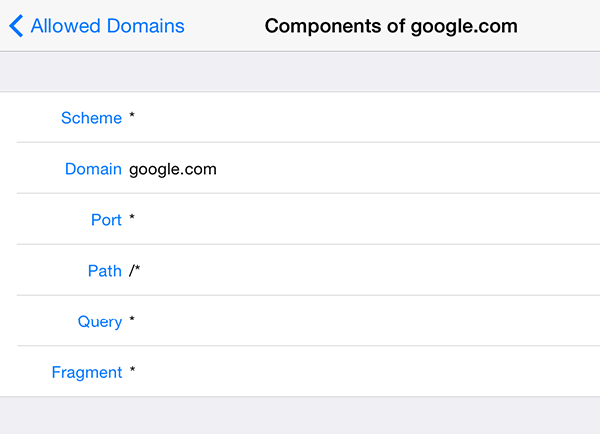 See Allowed Domains for more details. You can use wildcards (*) to stand in for certain parts of a URL so *.org would allow any web address on a .org domain (like 'http://www.example.org'). This setting allows you to define whether to apply the restrictions you defined in the Allowed & Restricted Domains settings to content that is embedded into an allowed page, but hosted at another location. This type of embedding is generally done through an iframe or object tag. When enabled, any embedded content is checked against the lists before it is displayed. If the url where the content is hosted is not allowed, the embedded content will not be shown. The rest of the page will load as expected and no off-domain alert will be shown regardless of the state of the ‘Show Off-Domain Alert’ toggle (as the primary content is allowed). For example, if you had a site with externally-hosted ad banners, enabling this setting would allow you to display the site without these banners. In this case, the banners would not show, no alert would be shown, and the rest of the page would load normally. When you disable this setting, only content that opens directly in the browser window will be checked against the Allowed & Restricted Domain lists. Content that is embedded into an allowed page will not be screened and will load regardless of whether the source url would otherwise be allowed. An example where you might want to disable this setting would be a site with embedded video content hosted on YouTube. Disabling this setting would allow these embedded videos to be shown normally without allowing navigation to the main YouTube site or the need to add each embedded video's URL to the Allowed Domain list. If the blocked domain is embedded content, this table will show both the URL of the page the content is in, as well as the URL of the embedded content that was blocked. When a URL is selected from the table, you can choose to add it to the pasteboard or automatically add it to your ‘Allowed Domains’ list. In the Basic, Plus & Enterprise versions of the app, the table can be exported to a .csv file into the Kiosk Pro Documents folder > '____com.kioskgroup.application.logs____' > '__navigation_blocking_log__.csv' by selecting ‘Export’ from the top right corner. To learn how to retrieve this file, visit our General Settings article. This setting allows you to display a message if a visitor tries to access a site either not listed in the Allowed Domains or listed in the Restricted Domains. If there are sites listed in the Allowed Domains and this setting is off, any non-designated link or web address will simply not work and there will be no explanation to the visitor. If this setting is enabled, Kiosk Pro will show an alert box informing the visitor that the website is not allowed. The Basic and Plus versions allow you to customize the text of the message. This setting is useful if you have a website containing many off-domain links, such as ads. This setting allows you to customize your text warning when visitors attempt to visit domains either not listed in the Allowed Domains or listed in Restricted Domains. Default: Sorry, this site is not allowed. This feature is useful if your web site is in another language or if you just want your message to match the overall tone of your kiosk content. If you are having problems running a page in Kiosk Pro, try deleting specific entries in the Allowed and Restricted Domains settings and turning on the address bar, then attempting to run the site. This will allow you to watch the address bar to see if this is a problem with the structure of your entries in these sections. Some sites use automatic redirects which are screened by the Allowed and Restricted Domains lists as well; by watching the address bar as the page loads, you can see if and how the page is redirected and then make the appropriate additions to the Allowed or Restricted Domains lists. You can also use the Blocked URL Log setting to view a list of URLs that have been blocked. If the site is still not loading we recommend clearing allowed and restricted domains entirely and running the site. If the site still doesn't run, you can try testing in Safari for iPad to see if there are any errors that pop up. One problem we have seen more than once are expired security (https://) certificates. Kiosk Pro is not designed to support pop-ups, so it is unable to handle this type of error.